Workers inspect the area near the coking plant. Repair crews cannot start to restore power supply to Avdiyivka because of ongoing militant attacks, a deputy head of the Donetsk regional military-civilian administration, Yevhen Vilynskyy, has said on Facebook. The repairs should have begun at 10 a.m. but have been postponed since. "Avdiyivka. 10 a.m. There is no ceasefire. The orcs keep pounding. Repair crews are ready to go. Have to wait..." Vilynskyy said in one of his many updates. Update 11:35. The antiterrorist operation (ATO) HQ reported that Russia-backed militants continued attacks on Avdiyivka with the use of artillery and mortars. Earlier, the ATO command offered a ceasefire on 31 January to allow the opposite party to recover their dead bodies. The enemy ignored the proposal. Update 12:05. The head of the Donetsk regional military and civil administration, Pavlo Zhebrivskyy, said on Facebook that a preliminary agreement on a ceasefire was reahed for 12:00. 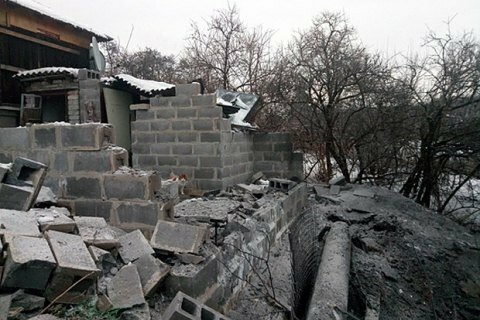 "As of 11:40, militants continue to use heavy weapons against Avdiyivka. There is no ceasefire. The Russian side did not provide a written confirmation of the ceasefire deal. There is preliminary information that the regime of silence may start at 12:00. Repair crews are ready to immediately get down to repairing the power lines," he said. Update 12:54. Militants do not respect the ceasefire agreement in Avdiyivka from 12.00, Interfax-Ukraine reported citing the General Staff of the Armed Forces of Ukraine. Update. 14:55. Repair crews could finally get to work, Vilynskyy said on Facebook . "Ceasefire. Repair crews went out to assess the damage and repair. Keep fingers crossed for our engineers who are doing their best to keep Avdiyivka from turning into a dead city," he wrote. In a short while, Vilynskyy said that the militants resumed shelling minutes after the ceasefire began. Repair crews are inspecting the area near the local coking plant, they are not allowed to go any further. Update 15:55. Pavlo Zhebrivskyy said the attacks did not stop, and the Russian side did not provide a written confirmation of the ceasefire deal. "Maintenance crews will not be able to reach the place where power lines were damaged... Fortunately, the coking plant managed to raise the temperature of the coolant in the heating system up to 44 degrees," he said. Previously, Russia said that the militants would stop shooting from 10:00 to 17:00 on 31 January to let Avdiyivka repair its life support systems. After the enemy shelling on Monday evening, the last power line to Avdiyivka was damaged, leaving the city without water, electricity and heating. The Avdiyivka coking plant helped the city to keep the temperature in the central heating system at 35 degrees. The air temperature in residents' apartments is 14-16 degrees Celsius.